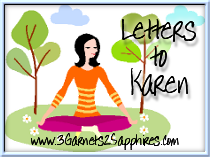 3 Garnets & 2 Sapphires: Letters To Karen: Someday . . . Letters To Karen: Someday . . . I know you have been suffering from a bad cold for 3 weeks now. It has been so long since you could speak without coughing, it is almost starting to feel like the norm to you. Perhaps your children have grown accustomed to your violent coughing, as well? Someday in the future, when you are having a coughing fit that is causing you to turn red with tears streaming down your face due to your having trouble breathing, one of your children will ask if you're okay or if you would like a glass of water instead of asking you, "MumMum, why is your face turning pink?" with a giggle. When your children reach the right age, they will do that. Apparently, 8, 5, and 5 are not the right age.